I found this entry in the Sookie Stackhouse series to be disappointing compared to the others. It was obvious to me who the villains were from the outset, so the intended reveal fell flat. 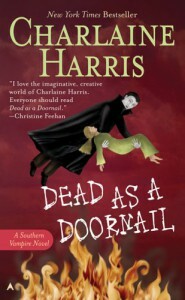 Also, after reaching the end, I definitely don't like Calvin Norris or Alcide Herveaux as much as I did. I suppose Harris is doing that intentionally, to remind us that getting involved with supernatural beings always involves complications, but the stuff with Alcide felt forced to me -- it felt like he was a different character than he'd been in previous books.